PNY's GTX 1080 Ti XLR8 OC delivers huge bang for your buck (for a $700 graphics card). Let’s be frank: Most of the customized versions of Nvidia’s beastly GeForce GTX 1080 Ti that you can buy offer largely similar levels of gaming performance. 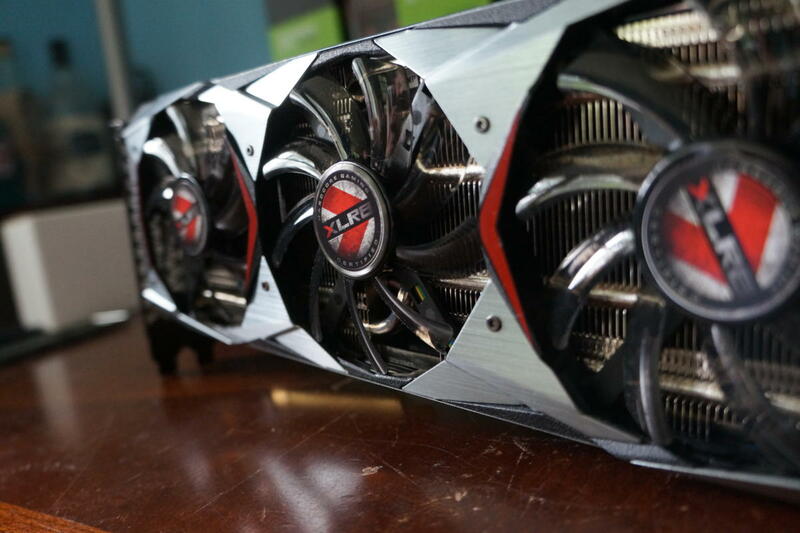 This monstrous GPU pushes Nvidia’s Pascal architecture as far and fast as it’ll go. That’s good in some ways. Aside from Founders Edition models, you know you aren’t leaving performance on the table by opting for one custom GTX 1080 Ti over another, and you shouldn’t have any problem pushing clock speeds up around the 2GHz range if you want to try your hand at manual overclocking. But it also means that custom cards need to bring a little something extra to the table if they want to stand out from the crowd. The PNY GeForce GTX 1080 Ti XLR8 OC ($720 on Newegg) does just that with a strong focus on the basics and some design decisions that make it refreshingly unique compared to many of today’s high-end graphics cards. Before we dive into the customizations found in the PNY GTX 1080 Ti XLR8 OC (“accelerate,” get it?) 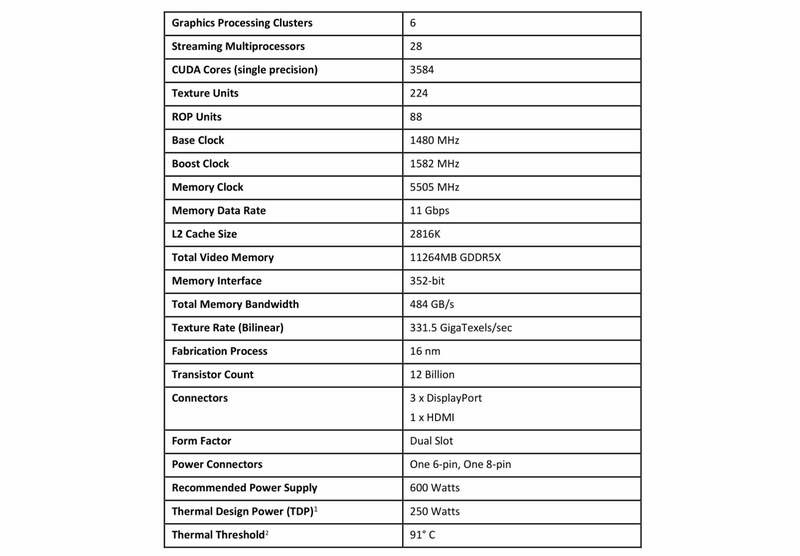 let’s quickly look at the reference specifications from the GeForce GTX 1080 Ti Founders Edition. Stock GTX 1080 Ti reference specs. The biggest under-the-hood change lies in the GTX 1080 TI XLR8 OC’s core clock speeds, which have been bumped up to a 1,531MHz base clock and 1,645MHz boost clock. 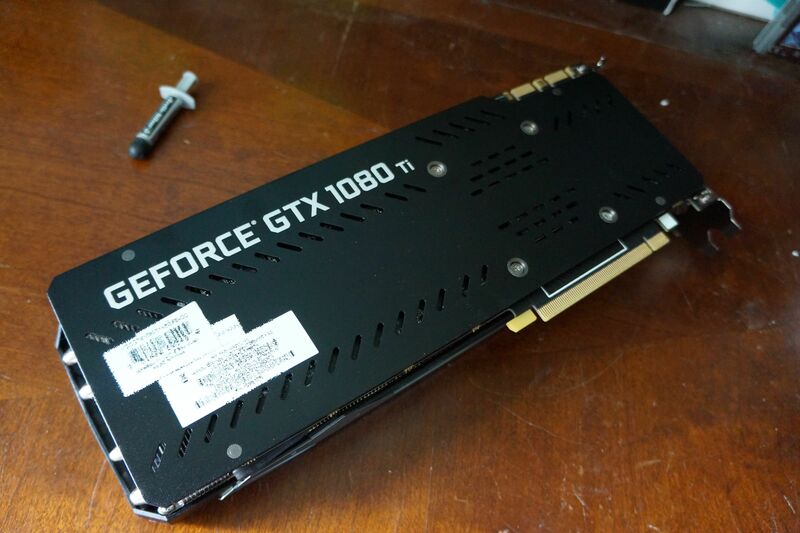 Again, that brings it in line with other custom GTX 1080 Ti cards, ready to chew through 4K games even when all the bells and whistles are cranked. Despite the boost, the PNY card still packs the same 250W TDP as the Founders Edition, along with the same 6-pin and 8-pin power connectors. The card’s physical design is more interesting, for a couple of different reasons. First: its thickness. While most custom GTX 1080 Ti cards expanded to beefy three-slot thicknesses to tame the ferocious GPU’s temperatures, PNY’s card joins EVGA’s GTX 1080 Ti SC2 and Nvidia’s Founder Edition model in being a standard two-slot size. Bad news for small systems, though: The XLR8 compensates by stretching out to a looooong 12.36 inches to house its triple-fan cooling solution and massive heatsink. 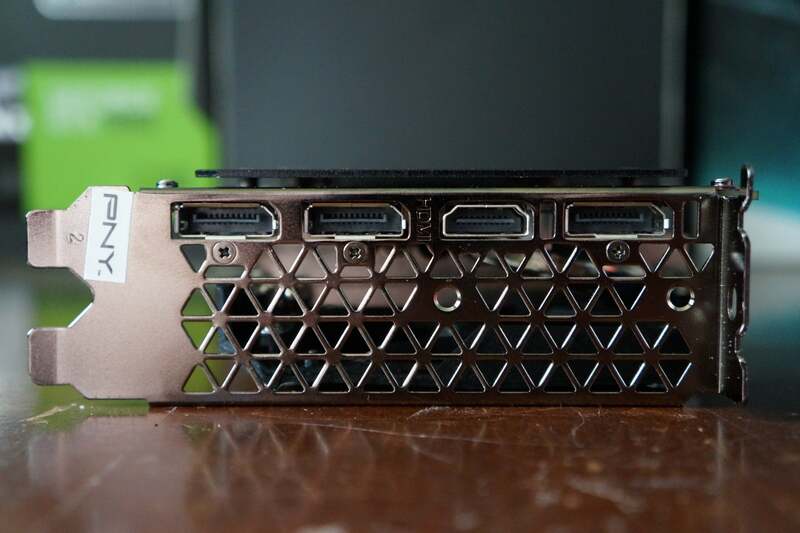 The PNY GTX 1080 Ti XLR8 OC. PNY’s XLR8 OC also ditches the gaudy RGB LED-laden aesthetics that most recent high-end graphics cards have embraced. 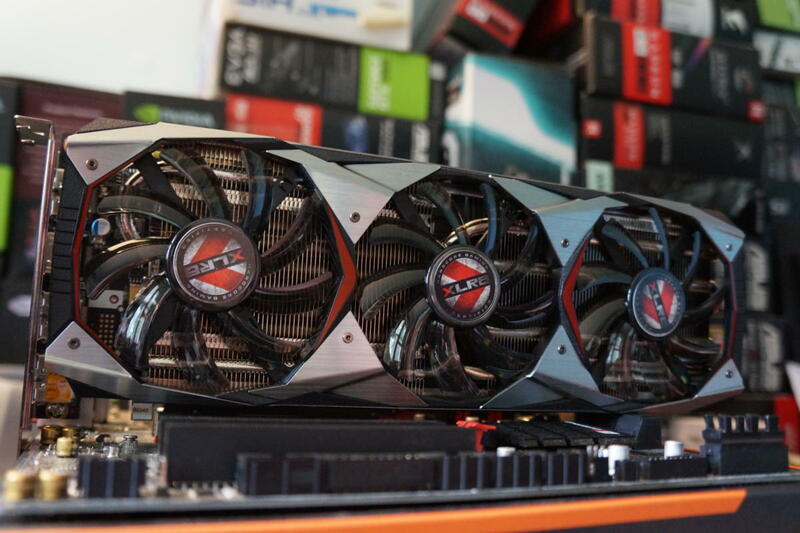 Instead, it opts for a graceful metal shroud, with angular accents somewhat reminiscent of Nvidia’s Founders Edition cards, broken up by the translucent-black plastic fans. The top of the card sports a black aluminum backplate with “GeForce GTX 1080 Ti” emblazoned in discreet gray letters. It’s an understated, yet attractive look overall—one likely to appeal to folks who loathe PC innards lit up like the Fourth of July. The rest of the card hews to stock specs. Like every GTX 1080 Ti, the PNY XLR8 OC rocks a borderline ludicrous 11GB of ultra-fast GDDR5X memory. Unlike some other custom versions, it also sticks to the reference design’s trio of DisplayPort 1.4 connections and solo HDMI 2.0b. You won’t find a DVI port added back to the mix, or any other noteworthy extras like dual BIOSes. This card focuses solely on the core gaming experience. The gorgeous and powerful PNY GTX 1080 Ti XLR8 OC delivers big bang for your buck despite being $700.